Anna Razumovskaya Hand Signed and Numbered Limited Edition Embellished Canvas Giclee:"Solo II"
Size: 20" x 30" - Select Additional Sizes from Drop Down Box. Edition: Artist Hand Signed and Numbered Limited Edition to 50. 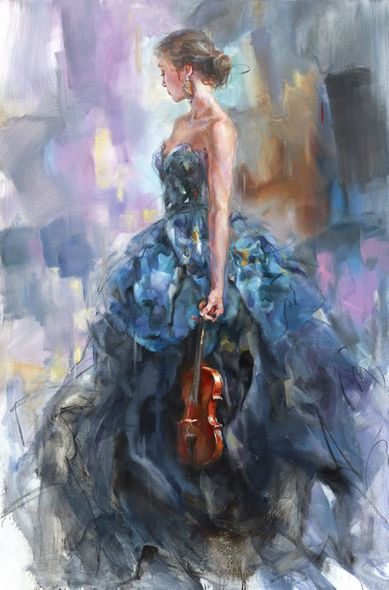 About the Art: With her classic figurative forms, highly acclaimed Russian artist Anna Razumovskaya magically captures the lyrical romanticism of renaissance portraiture, while creating art that is completely modern and original. Anna is inspired by the graceful elegance of the female form, at turns, classically alluring, demure and provocative. Her art has a pervasive sense of �romanticism', and the passionate and dynamic application of paint on the canvas and the artist's signature use of expressive color, combine to create her uniquely recognizable style.